These introductory courses offered through the College of the Environment are a great way to explore majors in the College or round-out your schedule with an engaging elective! Register for any of these courses using the MyPlan Academic Planner. Registration tips are available in the student online help center. Need help? Set up a personalized advising appointment with the academic adviser for the major that you are interested in or, if you are unsure which major is right for you, contact our pre-major adviser, Barbara Owens (coenvadv@uw.edu) for support. An introduction to the processes, materials and structures that shape Earth, and the relationship between human societies and geologic processes, hazards and resources. 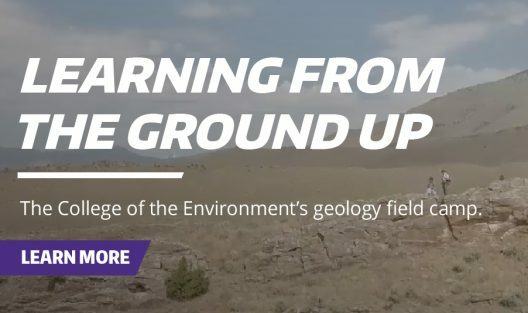 This is a great course for students looking for an introduction to earth sciences, and features a variety of field trips. Examine personal and global aspects of sustainability through issues such as smart growth, environmental and natural building, green businesses and energy, ecotourism, and international policy. Great course for students interested in making a impact on the environment. Extended field course offers wildlife science students personal interactions with wildlife managers and wildlife populations in strategic public and private lands in the northwestern U.S. and southern Canada. Read, watch and listen to a fantastic story from a recent trip to Yellowstone National Park. Explores the sun, solar storms, observations from space and from Earth; Earth’s space environment, radiation belts and hazards, plasma storms and auroras, rockets and propulsion, human exploration efforts, societal impact, planetary systems and resources, and project highlighting space and its exploration. Students will work in teams to create their own video games or interactive digital experience relating to climate change or other pressing environmental issues. Six weeks of geologic mapping in a variety of rock types in the Western United States. Enhances students’ knowledge of geologic phenomena and processes. Development of skills in mapping, field interpretation, and report writing.